WILLIAM HUGH EWEN (W.H. Ewen). Photograph Signed. Post-card real photograph with AUTOGRAPH signature. 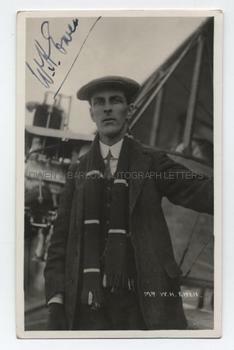 The photograph shows William Hugh Ewen half-length in cap and scarf posing in front of an early bi-plane. The Aeroplane can be identified as the 60 h.p. Caudron Biplane and the photograph was probably taken at Hendon in 1912. W.H. Ewen was an early pioneer of aviation, being only the 5th Scott to hold the Royal Aeronautical Society's aviator's certificate and the 63rd British person. His most noteworthy achievement came in 1911, when he became the first person to fly across the Firth of Forth. a feat which he achieved in a Deperdussin monoplane on 30th August 1911, making the flight in both directions. The flight lasted about ten minutes and covered a distance of 12 miles. In 1912 Ewen founded a flying school at Hendon. During WW1 Ewen flew in the Royal Flying Corps and the RAF, rising to the rank of Major. A scarce aviation autograph.